“Captain Action-Riddle of the Glowing Men” is a nostalgic bit of manna from heaven. First of all, it stars Captain Action, the classic Super-hero action figure from the 1960s. Second, it’s a pulp novel, a throwback to the days of The Shadow and Doc Savage. Third, it’s a briskly-paced cold war-style spy thriller, packed with action and clever dialogue. Jim Beard has crafted a tale that combines elements of action-packed movie serials with James Bond-style espionage and super-hero action and the end result is a fun short novel that entertains throughout and would make a hell of a movie. Beard tells this tale with a style that pays tribute to the almost B-movie qualities of the classic pulp novels, only with the pithy dialogue of a modern action movie and more than a few in-jokes that pay tribute to Captain Action’s origins as a classic action figure who could change into other super heroes with rubber masks and outfits. The story starts with Captain Action being attacked by foreign assassins. After dispatching them, the good Captain notices that their now-lifeless bodies are glowing green with radiation. Teamed with a beautiful Russian agent, Captain Action follows the clues and winds up in Siberia, where the story manages to tie a lost underground world and the Tunguska event to Cap’s arch-nemesis, Dr. Evil. The story is a blast, and going into further detail would spoil the twists and turns. Given the “decompressed” nature of so much modern storytelling, it’s refreshing to see a work that isn’t afraid to cram as much action as possible into its pages. Adding to the the retro, pulp-novel feel of the book are the moody interior illustrations by Rob Davis and the slick and delightfully lurid cover by Nick Runge. I picked up “Captain Action-Riddle of the Glowing Men” because I’m a long-time fan of the action figure (which is no secret to readers of this blog), but I have to say I was pleasantly surprised by the sheer gleeful enjoyment of this book. It’s a great way to revive the pure fun of reading. The premise of the show was that, in the far-flung future of 1999, when of course we would have a base on the moon, disaster strikes and the moon is ripped from the Earth’s orbit and goes hurtling through space, with the denizens of Moonbase Alpha still clinging tenaciously to its surface. Reviving this concept nearly forty years later requires quite a bit of the suspending of the disbelief. Not only did we never get around to building any Moonbases, but we also didn’t accidentally blow the moon out of its orbit some fourteen years ago. Once we make our peace with those quibbles, we can look at this book, which is pretty darned interesting. The first part of the book takes existing comics, drawn by the late, underrated master, Gray Morrow, and presents them in a “remastered” format, with tweaking, coloring and new material by Spanish artist, Miki. This is artwork that was originally created for Power Records and Charlton comics, and it’s not clear if Miki had access to the original art, or if this “remastering” was done from printed materials. The reason I put “remastered” in quotes is that it’s not remastering in the traditional sense. 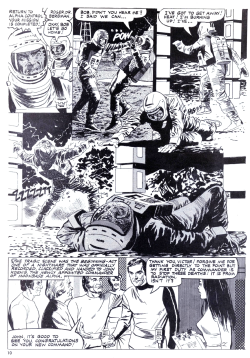 In this case, the original art created in the the 1970s by Gray Morrow has been extensively re-formatted, re-colored, and re-inked, with many new elements thrown in. One problem with this is that Miki doesn’t draw anything like Gray Morrow. The re-formatting and re-coloring was necessary, since this artwork is adapted from two sources, one was a storybook that came with a Power Records set, the other was printed in black and white in a rare Charlton magazine-sized comic book. The original black and white art, by Gray Morrow. Gray Morrow drew with a lovely Alex Raymond influenced fine line, and lots and lots of zip-a-tone shading. Much of the “remastering” obliterates Morrow’s detail, or covers it up with loud computer coloring and digital effects. Panels with new artwork or heavy-handed re-inking stand out like sore thumbs. There are also instances where smaller panels are blown up and juxtaposed against larger panels, which makes the fine lines from the blow-up look like thick marker lines. In one case, the detail from a small panel is blown up to fill a two-page spread, which just looks funky as hell. Morrow’s art was at it’s best when printed in black and white, and to see it drowned under heavy computer coloring is a bit of a sin. The variety of techniques used to enhance the original art also plays hell with the likenesses. At times, thanks to heavy retouching, Martin Landau’s Koenig looks like Martin Landau, or Lee Marvin, or Warren Oates, or Toshiro Mifune. To be fair, a lot of that was true of Morrow’s original art. Evidently some of the face-changing was done to avoid paying likeness fees to the actors, but their efforts are not entirely successful. I’ve been fascinated by the idea of remixing and repurposing old comic book art using modern digital tools. I think that there could be some really cool things that would come of people “sampling” the work of Mac Raboy or Lou Fine. Marvel has released a few comics that take classic Kirby and Ditko work from the 1960s and recolor it with modern techniques, but in this case, with this artist, I don’t think it works as well as it could have. This one falls into the “interesting experiment” catagory. The all-new artwork in “Aftershock” hangs together in a more cohesive manner. 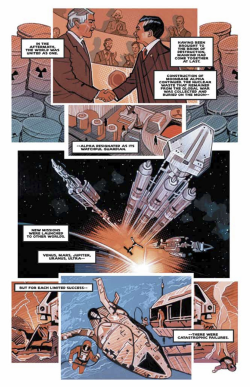 The artwork in the rest of this graphic novel, by David Hueso and Miki, who both work out of Spain, is pretty decent standard post-computer comic book work. It’s not spectacular, but it tells the story. While there are only two artists listed as working on this, the book has the tell-tale signs of being a studio project, with what appears to be a variety of styles by diverse hands on display. This looks like it was intended to be a mini-series, but was collected as an original graphic novel instead, and padded with the “remastered” content. The individual chapters are available separately from online comic sources, so that appears to be the case. Aside from the criticism of the art, this isn’t a bad comic book. It’s a pretty respectful updating of the original story that doesn’t try anything overly retcon-y in terms of changing the original concept. Andrew E.C. Gaska, the writer, obviously has a genuine affection for the source material, and tackles many of the unanswered questions left by the premature cancellation of the TV show after two seasons. 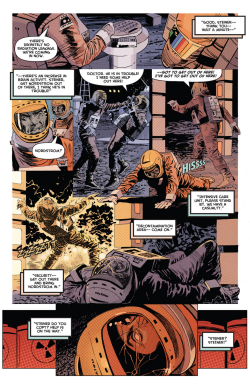 While the first part of the book is a faithful adaptation of the Space: 1999 pilot episode, “Aftershock,” the remander of the book, tells what happens on Earth after we lose the moon. 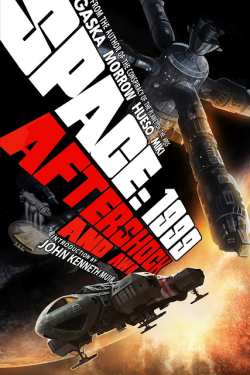 “Space: 1999- Aftershock and Awe” is a decent revisit of a classic TV show, with some flaws in the art, but still enough charm to appeal to fans of the original TV show or comics. It seems that this graphic novel might be a launching pad for a new series that would further explore the Space: 1999 universe. This is a good enough start to make that worth checking out. Can’t thank you enough for such a glowing – pun intended – review of RIDDLE OF THE GLOWING MEN – its so very gratifying to hear that readers are “getting” the book and its purposeful style and plot. I especially appreciated your mention of our “anti-decompression” and the pleasnat surprise it gave you. This review really made my day.